Our sense of smell is ten thousand times more powerful than any of our other senses. We smell immediately, the olfactory response extending directly to the brain, whereas other senses like touch and taste must travel through the body via neurons and the spinal cord before reaching the brain. Powerful! When something smells good, this is not a problem. But when something smells bad, it’s incredibly disruptive! Especially when food is involved. Not only does smelly food send a direct negative message via your sense of smell, it also affects your sense of taste. A double whammy! You can imagine the affect this olfactory process must have on the people with whom you live or work. Just because you enjoy a certain food doesn’t mean that others will share that affection. If you share a space with someone, particularly a work space, your mindfulness of that person’s odor sensitivities will be appreciated. 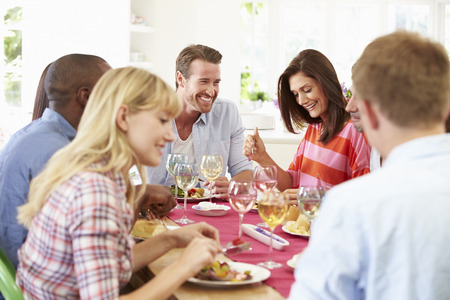 In a spouse, family, or roommate situation, it’s easier to get to know food preferences and the smells that can be tolerated or not. You might even come to an agreement on when you can enjoy the foods unappreciated by others. Work situations require more diplomacy. If you work in a small office and know your coworkers pretty well, it may be okay to ask if they mind if you reheat your garlic chicken in the microwave. However, in larger work environments, it’s probably not a good idea to be the culprit who spread the smell of garlic and other pungent spices throughout the third floor. In most cases where a large number of people are involved, there is always one or two who are either not very mindful, or just assume they won’t be a bother no matter what they do. In the case of smelly food, you probably aren’t the only one who has noticed and been disturbed. If your coworker just doesn’t realize it’s a problem, it may be time to discuss the issue. Approach the subject politely, directly, and with good heart and humor. Some have suggested small desk fans or scented candles, but being direct helps you with your practice of being honest. Mention that it’s a concentration problem for you. You’re not focusing on your coworker’s taste in food or making judgments. You might mention that you like popcorn, but the smell tends to distract you. If the problem continues, bring it up as a general issue in a group meeting without placing focus on a single person. In work environments where group meetings are not held, let your supervisor know. It may be time for a general office etiquette rule to be established and posted. When visiting various professional environments, I enjoy taking note of how they handle certain situations. Anytime several people regularly share the same space, boundaries will eventually be crossed. One office banned smelly food altogether with a sign in the kitchen area that read, “Do not smell up the place!” The occasional breach of personal etiquette guidelines by a few brought the final ruling from office management. Whatever rule is established, no mention of any specific cultural or ethnic food should be stated. Gentle descriptions of the culprits might prevent feelings of being singled out. “Strong smelling foods may not be warmed in the microwave” places parameters on the rule and leaves room for individuals to follow their own etiquette guidelines. Even with gentle language, a co-worker or boss might not realize his or her food has a strong odor. If it bothers you, personally approaching that person is in order. There may be general “bring something for everyone” days. If this is agreed upon by consensus, it may be the case that you could bring something for everyone. Showing consideration for those who share space with you makes for a pleasant environment – as well as pleasant relationships. 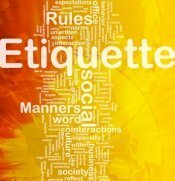 Civility through mindfulness of the needs of others, and the awareness that “space” is more than mere personal proximity, is anchored in etiquette rules.